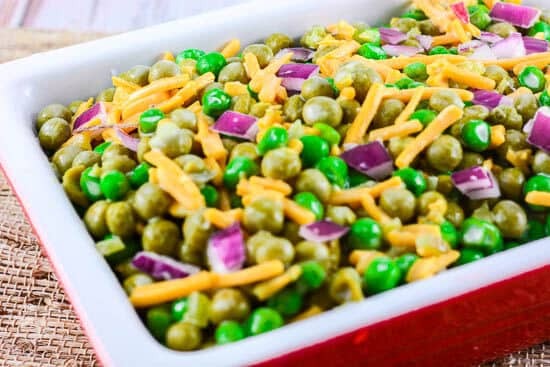 Grandma Lois’ Spring Pea Salad is my Mother-in-Law’s recipe that she has brought to every holiday gathering for years. It is a tradition. 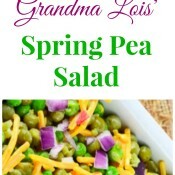 It would not be a holiday in our house without Lois or her pea salad. She gave me the recipe to share with you. I love it, not only because it is delicious, but because it is easy to make and can be made ahead of time so you don’t have to worry coordinating the cooking with the rest of the meal. I made a couple of minor changes in her recipe below. First, instead of white onions I used red onions just to give it a little color. Secondly, I used frozen peas instead of canned. But other than that, I followed the recipe. I know she is probably going to laugh that her recipe made it onto a cooking blog because she has never liked to cook. But this was her specialty, and her contribution to each holiday dinner. This recipe is a tradition in our family. What recipes are traditionally part of your family’s holiday dinner year after year? The day before serving the salad, prepare the hard boiled eggs, chop the onion, and sweet pickles. In a large bowl mix together the peas, onions, pickles, and eggs. Stir in 2 HEAPING tablespoons of Miracle Whip and 1 cup of shredded cheddar cheese. Stir until everything is coated in Miracle Whip and all ingredients are evenly distributed. Cover with plastic wrap and refrigerate overnight, until ready to serve. I’m not a miracle whip fan for the most part, but there is something about it in a salad that has a sweet tang that I like. Your dish is beautiful! What a beautiful salad!! Pinned and stumbled and all that jazz so I can find it easily!! This sounds delicious!! 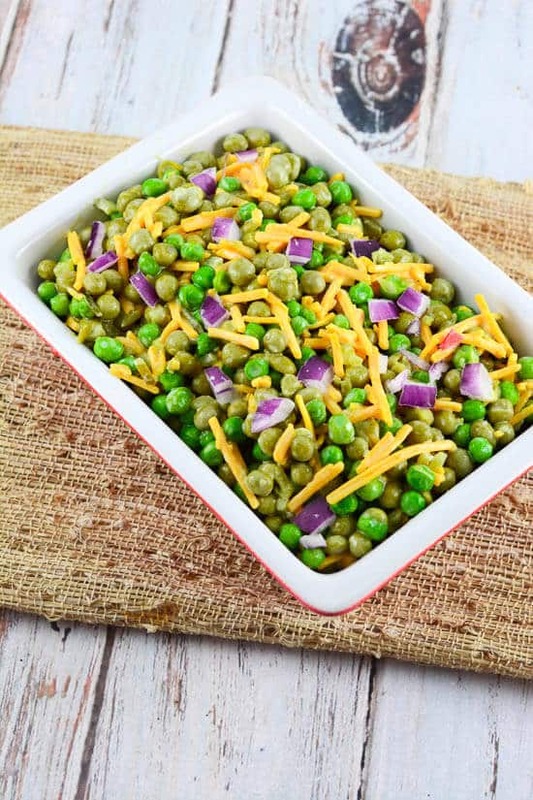 I can’t do canned peas though, I’d have to use thawed frozen,but yum! Love that it is one of those recipes that brings back memories of those we loved!